Several of the commentators on the riots here in Sydney have focused on the issue of multi-culturalism — and how far does freedom of speech go? That is a persistent debate in a diverse society. How can we accept a degree of conflict between an energetic minority — religious or political –and the rights of the larger majority? The western political system, in various forms has created laws to regulate this conflict. In Australia and America, by and large, it works. So why do we seem to be fearful of Muslims? Is our system incapable of dealing with the conflicts some of them seem to be associated with? All this brings to mind a movie I saw once, High Noon. An American western may be a poor metaphor but it can also potentially bring to light some deeper issues in ouir current siutation. A small town marshall, Gary Cooper, has just married Grace Kelly and has resigned as marshall. On the day that Cooper is to leave town, evil arrives, in the guise of three hoodlums who are awaiting the noon train, friends of a man who wants to kill Cooper. The town meets and agrees that Cooper should just leave on his honeymoon — with the hope that the evil will leave their town alone. Cooper does leave town, then returns, because he is concerned about the town’s safety. The entire town refuses to help him and even his wife turns against him. But he confronts the evil and, in the end, triumphs. What has this got to do with multi-culturalism and the riots? First of all, let me be very clear. Islam is NOT the evil! Protesting blasphemy is NOT the evil. What, then, is the evil that threatens out peaceful community? That is a puzzling question for us. Certainly 9/11 was evil, but what evil is arriving in Australia on the “noon train”? And, is our “sheriff” — our system of laws — incapable of dealing with it”? Second, Hollywood’s solution was a violent showdown. Gary Cooper met and killed the bad guys, all alone. That was the mythic solution in many American westerns — the good guys defeating the bad guys in a shoot-out. But we here in Australia have no such myth. So, how do we envision good defeating evil? That is another puzzling question for us. Our police can keep evil at bay, and they do a wonderful job of that. But they cannot not defeat evil and drive it from our peaceful shores. As Gary Cooper attempted to tell the small town, there is strength in numbers. If we face the bad guys together, we will triumph. But the town people refused to get involved. Isn’t that the real message of High Noon for us? And aren’t the Muslims themselves resident in our town, with us? 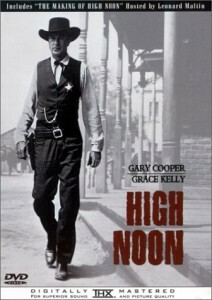 As High Noon shows the real threat is the age-old “not me” attitude that the townspeople demonstrated. The entire small town gathered in a church and debated what to do about the evil arriving on the noon train in the movie. They decided that they should do nothing, and hope the problem would just go away. They did have a conversation in the church, but it was wrong-headed. Each person only looked at the impact on himself or herself, if they joined Gary Cooper in fighting the evil. They never discussed the “we” of the town, only the “I” of personal risk. Not having civil conversations and debates with our Muslim neighbors, about the nature of the evil that threatens all of us, and what “we” will do about it. I skyped with a good friend of mine in London, who is muslim, on the issue of the movie (actually a short YouTube video). He asked me what was it about,as he had not seen it. I had taken the time to look at it and told him it was poorly made and was denigrating to Muhammad. We spoke at length about reactions and he was very clear in saying that as bad as the video may be, it would never cause a reaction in him as we are seeing in the muslim countries. I said the same: if this had been made about Jesus, I would find it distasteful in the fullest, but never would have any feelings towards wanting to behead somebody, nor would I believe for one moment that any group of christians or for that matter any other religion would act in such a way. So we discussed what we feel is the underlying cause of the rioting. One thing we could agree upon was the conditions in these countries was such that the majority of the people are destitute, have no sense of freedom in any manner, including religion, and are being controlled. Is this the majority of those people we see in the crowds on the tv and in the newspapers? Let’s look more closely next time as the cameras pan on the few who are burning the flags and effigies of our leaders and leading the chants. We forget in many countries, especially muslim countries, how much the few control the many. Bottom line, we should be asking our leaders to stand up and let these people know that democratic countries support their efforts to throw out the despots who control them, that in democratic countries we have freedom of speech, and we also tolerate all religions. They will be given a chance to vote and to change their lives for the better. How many countries can we list that we have supported,. who have made the choice of democracy and are better off for it? It’s easy to compare South Korea to North Korea, and the other tiger countries. Even Russia and China are feeling the effects of people wanting a say in their government. All of these things can happen in the Middle East, in Muslim countries, but it’s going to take political leaders who will stand up and support the tenets of democracy.